This month, I got back on track with my reading and ended up reading some wonderful books. A Cartload of Scrolls: 100 Poems in the Manner of T'ang Dynasty Poet Han-shan by James P. Lenfestey (I won this book from Diane at Carp(e) Libris, and it's absolutely wonderful. Look for a Poetry Friday review soon. Thanks Diane! Alright, so that's 28 for the month of April, bringing me to a total of 79 for the year. I have 121 left to read by December 31st, and I'm hoping to get a good chunk read during MotherReader's 48 Hour Book Challenge in June. Chico Bon Bon is a monkey who owns a tool belt full of tools—from the conventional screwdriver and drill to the not-so-conventional donkey wrench, zoozle, and snozz remover. On any given day, Chico Bon Bon will use these tools to build and fix things for his friends and family. He is extremely creative as is evidenced by the clock he builds for ducks and the small roller coaster for local chipmunks. One day, a devious organ grinder looking for a new circus monkey lures Chico Bon Bon into a trap and takes him back to the circus camp. Luckily, Chico Bon Bon has his trusty tool belt with him and devises a plan to escape—the execution of this plan will leave children laughing and cheering for Chico. While the story and text are very funny, it's Monroe's hilarious and highly detailed illustrations that will keep kids coming back to the book. The most elaborate illustration is that of the organ grinder taking Chico Bon Bon through the town to the circus camp. We see him traveling through the town on a winding road, passing by a pond, a smoothie hut, a park, a bookstore, and more. Each time I look at this page, I see something new. I gave a copy to my friend Chris who has two daughters, ages 6 and 3, and he says it's quickly become a favorite in their house. If you're looking for a funny book that will keep kids asking for you to read it to them, Monkey with a Tool Belt makes a perfect choice. I sincerely hope this isn't the last we see of Chico Bon Bon. A Fuse #8 Production: "Monkeys are funny. Tool belts are not funny. So how do we account for the fact that monkeys plus tool belts are very funny? I've no idea, but if Chris Monroe keeps churning out more picture books of this style and flavor, I'll be a happy woman. Definitely a keeper for the tool belt and monkey lovers of the world." Jen Robinson's Book Page: "Really, I think that everyone who has young children should go out and get a copy of this book. I might see if I can buy it in bulk, for all of my gift-giving needs. Monkey with a Tool Belt has my highest recommendation." Zion School Library: "After reading Monkey with a Tool Belt aloud to 1st graders, they gave the book the highest praise by asking 'Is there another 'Monkey' book? If there isn't there should be!'" Three Silly Chicks: "Monkey with a Tool Belt is a book kids will enjoy mightily. It's all that and a banana hammer!" At nearly 14 months old, my little chica is beginning to understand the meaning of "yes" and "no." While she can't say the words yet, she nods or shakes her head, and when she's getting ready to do something she knows she's not supposed to (like eat dog food...ewww), she'll sneakily look around to see if anyone's looking. Needless to say, we're having a lot of fun with Leslie Patricelli's No No Yes Yes . In the book, a baby dressed only in a diaper with one springy curl coming out of the top of its head does a variety of both good and bad things. On the left side of each interior spread, the baby is doing something he/she shouldn't be doing, such as eating dog food, pulling the cat's tail, and dumping bath water on the floor. "NO NO" is written across the top of these pages. On the right side of the page, the baby is doing something he/she SHOULD be doing, such as eating a banana instead of dog food, gently petting the cat, and keeping the bathwater and toys in the bathtub. "YES YES" is written across the top of these pages. The humorous pictures will make children laugh, and with "no no" and "yes yes" as the only words in the book, children and parents can make up their own stories. 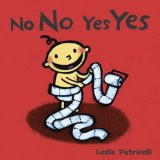 A fun way to teach the "Yes/No" concept, this book would make a nice gift for young children. I've always been a sucker for travel guides, destination books, travel websites, etc. I think it's a combination of the control freak in me who likes to plan every trip down to the very last detail and the wanna-be world traveler who loves to learn about and visit new places. Now kids who love to learn about new places can do so with Laura Crawford's bilingual Traveling with Anna/ De Viaje con Ana series. This interesting blend of fiction and nonfiction introduces children to U.S. cities through postcards written by the fictional character, Anna. Each interior spread includes interesting information about a site or landmark in the city featured in the book in a number of ways. First, Ana writes a postcard to a relative or friend about the site in English. Next, three interesting facts about the site are written in both English and Spanish. Finally, a full-color photograph is also included in the spread. Anna's postcards introduce kids to the featured city through a child's eyes. For example, in the Washington, D.C. book, when writing about the Lincoln Memorial, Anna wraps up her postcard with, "I wanted to climb on his lap, but Mom said no." I can only imagine how many children in real life have wanted to do this. The bulleted facts themselves are appealing instead of the "boring" details kids are used to reading in history textbooks. Sticking with the Lincoln Memorial spread, kids learn that Lincoln's nickname was Honest Abe, that he never received a lot of formal education, and more. Presenting the facts in both English and Spanish opens the doors to a variety of readers, including those learning English and/or Spanish, ESL learners, and Spanish speaking parents who have limited books in their language in which to read to their children. I only wish the postcards were written in both languages instead of just English because the postcards make the books unique and hold the greatest appeal. The straightforward and clean book design makes the books appealing to older learners who will most likely not be embarrassed to be seen with the book. When I taught ESL to high schoolers, I had a big challenge to find books at their English-reading level that weren't too childish. They were constantly complaining that they couldn't find anything other than "baby books." The Traveling with Anna series would make wonderful resources in a geography, social studies, ESL, or Spanish classroom. They'd also be a great way to introduce children to different US cities and to get them excited about vacation if you happen to be visiting one of the cities in the book. I look forward to seeing more books in the series. Richard Wilbur published his first poem when he was 8 years old. He went on to translate Moliere and Racine, write lyrics musicals, win the Pulitzer Prize, and become the U.S. Poet Laureate. If you've never been inspired by laundry, now's your chance. There's quite a buzz in the kidlitosphere about Jim Averbeck's new picture book, In a Blue Room (read my review here). I recently had the fortunate opportunity to interview Jim Averbeck. Here's what he had to say. Where did you get the idea for In A Blue Room? Did you base it on any of your own childhood bedtime memories? You know, so much of writing happens on a sort of intuitive, subconscious level that it is hard to pinpoint when an idea is born, much less where it came from. I do know that with “In a Blue Room” I had decided to write a story that was a combination concept book (about colors) and a bedtime book. Then I threw in the concept of the five senses and story of a mother/daughter relationship. I tossed a few more things into the mix hoping that from all this complication simplicity would be born.Then, through multiple revisions, I somehow ended up with the 221 words that make up the story. If anything of my own childhood crept into the story, it was the love and care I received from my own mother. No doubt Alice’s patient mom finds her roots there. Of course, my mom had six kids, so I doubt I ever got the kind of time and attention Alice does in the story. This is your first book. What inspired you to write for children? The untold riches available to children’s authors… Seriously, when I was in the corporate world I realized that so much of your life is spent at work, that you better love what you do. I thought about what I spent most of my leisure time on: Reading! I thought it would be a coup if I could get someone to pay me to do that. Until I figure out how, I decided writing was the next best thing. I write for children because I am really just a big kid. How long did it take you get published once you decided you wanted to write this book? The oldest version I could find in my files was from September 2002. So, I guess that means it took 5-1/2 years from inception to publication. Is Alice named after anyone in particular? When I wrote In a Blue Room, I knew I wanted it to have the feel of a classic picture book - simple lyrical language about a timeless, universal experience -with a twist at the end. So when I chose a name for the little girl in the story, I chose a name from a classic of children’s literature. She’s named for Lewis Carroll’s Alice.It was probably pretty presumptuous of me. I also liked the soothing sound the name has. What were your first impressions of the illustrations when you saw them? When I first received the black and white sketches, I was blown away. Tricia had extended the original ending in a way that I found breathtaking. I don’t want to say too much, because I want people to experience it for themselves, but she leaves the reader with the idea that the blue room of Alice’s story is our shared “blue room” of planet earth, which helps explain why, even though Alice’s room is yellow at the beginning, the text saying Alice is “in a blue room” is correct. It’s really quite a remarkable interpretation. Do you have another favorite book that Tricia Tusa has illustrated? I teach a class on how illustrators can bring “more” to a picture book than the text shows without hijacking it. One way is for them to bring a broad, universal story down to a personal level. I use Tricia’s book “The Magic Hat” (written by Mem Fox) to illustrate this. I love the ending, where the great, powerful magician of the story, the owner of a magic hat that transforms those who wear it into something else, removes the hat and is revealed to be a little boy. I suppose Tricia does just the opposite for “In a Blue Room.” She brings a very personal story up to a universal level, literally. Too many things to name:Getting lost in the story… The way word choice can support what you are trying to say... The puzzle-like beauty of language… Oh! And then there are the hours, which are basically whenever I make them. Punctuation, however, I hate. Did you have any favorite children's books when you were a child? D'AULAIRES' NORSE GODS AND GIANTS was one I read over and over.I couldn’t pronounce half the names in it; Thor was always wielding his hammer mjolnir against Utgardsloki while Odin sat on Lidskjalf.What a bunch of jawcrackers! But I loved the stories.I also remember being moved (though I wouldn’t have called it that in the first grade) by The Giving Tree. What authors have most influenced you? When you're not writing, what can we find you doing?Mostly feeling guilty because I’m not writing. That depends on the labyrinthine course of publication. I actually sold my first book, “Little Spoon-Ears,” in 2002. About once a year, the publisher contacts me to tell me they’re 100% behind the book. Maybe they’ll accidentally publish it in the next year or so. What do you hope children get out of In a Blue Room? I hope children get pleasant dreams and their parents get a good night’s sleep. Thanks so much for your time Jim, and I wish you the best of luck! Nevertheless, realizing that the whale could feed their people for months, the people of the camp agree to help out. What follows is an account of an exciting hunt for the great Arvik. Tuk and the Whale is a story that provides a glimpse into what life was like for the Inuit people very early on in the whaling industry. We see the importance of whales to both the European whalers and the Inuits, though both are very different. Throughout the story, readers are introduced to a number of Inuit words, and a short glossary in the back of the book defines each one. It's obvious that Ms. Rivera conducted thorough research to write this book, and she did an exceptional job of seamlessly weaving details of her research into a story that reveals the importance of family, teamwork, and tradition. I appreciate the fact that Ms. Rivera does not neatly tie the book up in a pretty little bow. Instead, it foreshadows the serious troubles that befell the native peoples in the boom of the whaling industry. Young readers will enjoy reading this book, and it would make an excellent introduction to a unit on the whaling industry and the Inuit culture. 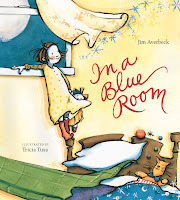 In a Blue Room by Jim Averbeck, illustrated by Tricia Tusa. It's past Alice's bedtime, and she insists she can only sleep in a blue room. Luckily, her loving mother knows just what to do to get her little one to sleep, from bringing her lilacs and lilywhites to hanging lullaby bells in her window. Before you know it, Alice is fast asleep, her room drowned in the pale blue light of the moon. Tricia Tusa's soft and whimsical illustrations are simply divine and perfectly complement the warm tone of the text. They also have Ms. Bird at Fuse #8 making early Caldecott predictions. In just a few short pages, Jim Averbeck successfully shows us the tenderness between a mother and daughter and even gives us a glimpse of our place in the world. This is absolutely one of the best picture books I've seen this year, and it's going to keep a prominent spot on my daughter's bookshelf. Shelf Elf: "For sleepy heads, dreamers, and the grown ups who tuck them in. Bring your own flowers, tea, quilts and lullaby bells." Read the rest here. Seven Imp: "This is an ethereal little gem of a book that works as a bedtime charmer, and if you’re one looking for curricular connections, this is a nice choice for books about the five senses as well." Read the rest here. A Year of Reading: "The book is what it needs to do -- soothing, quieting, calming. I daresay Mama is feeling much better by the end as well." Read the rest here. Be sure to stop by on Friday because I will be posting my recent interview with Jim Averbeck himself. Find out where he got the idea for In a Blue Room, who Alice is named after, and more. For this week's Baby/Toddler/Preschool selection, I'm bringing you a favorite in our house. Well, anything by Eric Carle seems to be a favorite in our house. My daughter is fascinated by his colorful tissue paper collages and loves to touch (smack) the illustrations. "Brown Bear, Brown Bear, What Do You See? I see a red bird looking at me. Red Bird, Red Bird, What Do You See? I see a yellow duck looking at me." This repetition lets kids know what to expect, and soon they'll be "reading" along themselves. They'll also laugh at the idea of a purple cat and a blue horse. The white dog in the book looks enough like our own white dog to keep my daughter flipping to the page in the book and staring first at it and then at odog. This book is great for babies who are just starting to recognize colors and shapes, and it's a great book to introduce toddlers and preschoolers to color words and animal words. Check out this site for a variety of great activities you do with the book. If you have a review of Brown Bear Brown Bear What Do You See? leave a comment with your link, and I'll post it here! It's Nonfiction Monday, and in honor of Earth Day on Tuesday, here's a book that gives children a comprehensive look at global warming. Did you know that sea levels are rising at a rate that's three times faster than a hundred years ago? That climate changes are causing Adelie penguins to travel so far that they're arriving too late at their nesting grounds to rear their young? That native peoples of the far north are having a more difficult and dangerous time hunting due to the warming climate? 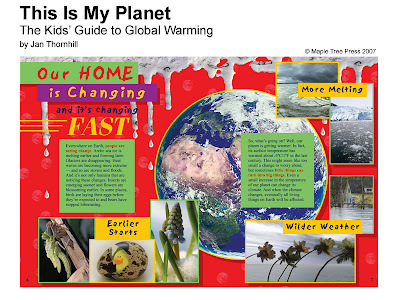 You'll learn more about this and much much more in This Is My Planet: The Kids' Guide to Global Warming. Using simple, straightforward language Jan Thornhill shows how the world is interconnected and the cascading effects caused by global warming. The book reminds me of a scrapbook with color photographs and illustrations scattered throughout that will appeal to even the most reluctant of readers. Presenting basic information like the carbon cycle and different climate types and more complex concepts such as greenhouse gases, Ms. Thornhill never comes across as preachy or accusatory. Instead, she presents straight facts and gives readers solid recommendations for what they can do to help protect the earth. The back of the book includes additional online resources where readers can go to find more information. This would make an excellent resource for a science class. Highly recommended. Visit the Nonfiction Monday roundup at Picture Book of the Day. I admit that I've been a bit resistant when it comes to audio books. For quite a while, I've been having an internal argument with myself. "Jill," I said, "it's not really reading. You're cheating if you listen to a book instead of reading it. Plus, what if it's boring and you can't pay attention?" So, for the past five years, I've been commuting to work, an hour each way (sometimes longer, depending on traffic), listening to crappy radio stations full of commercials. Then I read this post at Jen Robinson's Book Page about Audible launching AudibleKids, an audio book site for children's books. So, I thought I'd at least take a look at Audible's Website, and saw that they were running a promotion--$7.49 a month for the first three months. "Jill," I said, "you just spent 2 hours in traffic listening to crappy radio stations. Why not try it out? I mean, you don't really get the opportunity to read as much as you'd like, so why not spend your time in the car listening to books?" I convinced myself to join, and then came the dilemma of what to buy with my credit. There were so many books listed that I've always wanted to read, some classics that I've never read, some contemporary novels. I just couldn't figure out what to read, so I asked Wes, the Poetry Friday dude at The Well-Read Child. He's extremely well versed in the classics and immediately suggested Les Misérables . I put my faith in Wes' suggestion and downloaded the unabridged edition of Les Misérables. This 1400 page book comprises nearly 57 hours of audio! That's a heck of a lot of commutes, and can I just tell you that after two weeks, I am hooked so much so that I find myself sitting in the car for an extra 10 minutes after I arrive at work just to hear what happens. Without giving too much away, Jean Valjean is at the trial. I don't know what he's going to do. Will he confess or let an innocent man go to prison? Will Fantine get to see Cosette again? What will happen to poor Cosette if he doesn't come back? I can't believe my stubborn self waited all these years before trying out an audio book, but I'm so glad I did. Now, I only have to decide which book I'll download next month. I definitely want to stick with the classics, so what will it be? War and Peace? Anna Karenina? Any suggestions? Who shares the biggest responsibility for reading to your children? The International Reading Association pointed me to this article that details the results of a recent poll conducted among 2,200 adults in the UK. Forty two percent of the fathers polled said they didn't read bedtime stories to their children, citing stress and long work hours as the number one reasons. Seventy six percent of mothers, on the other hand, say they DO read bedtime stories to their children. The article goes on to say that boys need male role models to read to them in order to get them to love reading. Hmmmm....I'm not sure what I think about this. I know the intent of the study was probably to convince fathers to read to their children, but what about the households that don't have a male parent? I know plenty of mothers who read to their sons, who in turn, grow into avid readers. Without knowing enough about the study, it doesn't seem as if they interviewed families that fell outside of the "traditional" definition of family (mother/father/child(ren)). There is no doubt about it that children should be read to, but does it matter which parent? Should both parents, whether it's mother/father, mother/mother, father/father, share the responsibility? I think that when children get read to from a variety of people, it exposes them to more books, but does it have to be a parent? In my household, I do read to my daughter the most, but I think that's because I'm more likely to pick up a book and start reading than my husband who prefers to get on the floor and play with her. However, he does read to her, and I play with her. Her grandparents also read to her when they see her, and she gets read to every day in daycare. I also love to watch her being read to and to see the different approaches people use. For example, my mother-in-law will point at the pictures and make up her own story while I often read the text word for word. My husband will do a little of both, and Miss Mary, her daycare teacher tends to use more exaggerated body language and different voices. But what if there is only one person who reads to a child? Does that mean that child is less likely to become a reader? I don't think so, and I don't think it has to be a parent. Sometimes it's a teacher, a neighbor, an aunt or uncle who opens up the door to reading. What do you think? Who shares the biggest responsibility for reading to your children in your household? Poetry Friday: Philip Larkin's "Aubade" - "I work all day, and get half drunk at night"
Thanks for visiting! We're happy to be hosting Poetry Friday today at The Well-Read Child! Leave your link in the comments, and we'll post the roundup throughout the day! In the Middle Ages minstrels sometimes sang Aubades, or songs about lovers parting at dawn. This theme was revived by metaphysical poets like John Donne. In "The Sun Rising," he rails against the sun for its interruption of lovers. In "Aubade," Philip Larkin replaces one lover with death, and speaks of night not as romantic cover but as an encounter with "what is really always there," mortality. The parting lover becomes the parting of this consciousness of mortality in exchange for the glare of distractions from it -- socializing, work, religion, drink. "I work all day, and get half drunk at night." Stacey and Ruth over at Two Writing Teachers have been hosting a One Week Poetry Challenge all week. If you haven't checked out all of the wonderful poems, now's your chance. Be sure to also check out Stacey's original poem about joy. Tiel Aisha Ansari at Knocking From Inside brings us an original piece, "Edgar on Time", with an epigraph from Shakespeare. Tricia at The Miss Rumphis Effect shares Paul Laurence Dunbar's "The Debt". Elaine gives us two treats this week. First, at Wild Rose Reader, find an interview with Joyce Sidman. Next, at Blue Rose Girls, read Archibald MacLeish's "Ars Poetica." John at The Book Mine Set shares a review of Selected Poems of Federico Garcia Lorca, translated by Martin Sorrell as well as a "Do-it-yourself" Lorca invitation. See what John came up with, and give it a try yourself. Jenny at Jenny's Wonderland of Books joins us for her first Poetry Friday and brings us two poems by Vachel Lindsay. Welcome Jenny! Devin at Speak of the Splendor shares May Swenson's "Analysis of Baseball." Gregory K. at GottaBook is in with an original poem, "There's a Closet in My Nightmare." Marie at Literacy Details shares a poem by Kristine O'Connell George. Jama at Jama Rattigan's Alphabet Soup is in with poems about being late by Jeffrey McDaniel and Ted Hughes. Cloudscome at A Wrung Sponge brings us an original, "First The Flower, Then the Leaf", her response to Tricia's Monday Poetry Stretch. Sarah at In Need of Chocolate shares W.B. Yeats' "The Cat and the Moon." Andrea and Mark at Just One More Book! share their podcast review of the rhyming picture book, Best Friend on Wheels. writer2B is in with W.S. Merwin's "The Unwritten." Ruth at There is No Such Thing as a God-forsaken Town, bids farewell to Aimé Césaire, who died yesterday. Carol from Carol's Corner joins us for the first time bringing "Confessions of a Reader." Welcome Carol! Lisa at A Little of This, A Little of That brings "The Pow Wow at the End of the World," by Sherman Alexie. Sarah at Just Another Day of Catholic Pondering celebrates spring with Lawrence Raab's "Cold Spring." Mme T at Destined to Become a Classic offers Don Paterson's "Poetry." Sara at Read Write Believe shares the poem she carried in her pocket yesterday: Elizabeth Bishop's "The Filling Station." Mary Lee at A Year of Reading shares some acrostics written by her students. Seven Impossible Things Before Breakfast shares an interview with The Poetry Seven, the seven bloggers who created last week's crown sonnet, "Cutting a Swath." Anastasia at Picture Book of the Day is in with the picture book, Jazz Baby. Jenny at Little Acorns Treehouse brings us "Jerimoth Hill" by Tom Chandler, a poem that describes the landscape of Rhode Island. Becky Levine offers up an original poem this week. Karen Edmisten shares Frances Thompson's "The Hound of Heaven." In celebration of GLBTQ poetry, Lee Wind from I'm Here. I'm Queer. What the Hell do I Read? shares Dennis Cooper's "James Kelly." At Bildungsroman, Little Willow offers Hart Crane's "Chaplinesque. " At World of Words, Marcie shares some Mother Goose rhymes. Becky at Becky's Book Reviews shares "Rated PG-13", a fairy-tale related poem from Vivian Vande Velde's Tales From the Brothers Grimm and the Sisters Weird. Becky at Farm School offers an Adrian Henri fractured fairy tale poem, and a bit of Charles Causley's thoughts on poetry for children. Miss Erin brings us "Winter's on the Wing," from Secret Garden, the Musical. MsMac at Check It Out shares a winning poem from one of her students and some great haiku from third graders. Susan T. at Chicken Spaghetti gives us Josephine Jacobson's "Monosyllable." Lisa Chellman at Under the Covers muses about Oscar Wilde, the value of beautiful wallpaper, and why she writes. She also gives us snippets of some of Wilde's and John Keats' poetry. Marjorie at Paper Tigers talks about about children's poets Michael Rosen and Jorge Luján's share of a talk at the Bologna Book Fair. Be sure to check out the animation at the end! Suzanne at Adventures in Daily Living brings "The Windhover" by Gerard Manley Hopkins. a. fortis at Finding Wonderland brings us two gems from T.S. Eliot. Liz at Liz in Ink shares some "poetry-centric ramblings" and a E.E. Cummings' "My Love is Building a Building." Gina at AmoXcalli implores us to Save the Tacos. Also check out Gina's poetry news and student animation over at Cuentecitos. Anamaria from Books Together brings us "Los Zapaticos de Rosa" from Cuban poet, Jose Marti. MsMac offers up an original poem regarding her absence at a book challenge hearing for MT Anderson's Feed. Fuse #8 is in with a post about the poetry collection, Inside Out: Children's Poets Discuss Their Work. Liz B. at A Chair, A Fireplace, & A Tea Cozy gives us "The Red Wheelbarrow" by William Carlos Williams. Felicity at Look Books gives us Mary Oliver's "Summer Day." The Reading Zone offers up an original poem as part of Two Writing Teachers' One Week Poetry Challenge. Kelly at Big A little a gives a review of Jan Greenberg's Side by Side: New Poems Inspired by Art from Around the World. Kelly Fineman at Writing and Ruminating shares "The Lion and Albert" by Marriott Edgar. Finally, Christine at The Simple and the Ordinary offers up "Flowers" by Robert Louis Stevenson. Thank you everyone for your wonderful posts! It's been a pleasure hosting. Told in first person from Ms. McGill's point of view, her great-great grandmother, Jane, was a slave born on Ol' Man Deboreaux's Georgia plantation. In 1842, when Jane was sixteen, Ol' Man Deboreaux bought five new slaves whose hunger for freedom rendered them magical powers that set them free. This story of hardship, hope, and belief has been passed down from generation to generation in Ms. McGill's family through her great-grandmother, Mama Jane, the daughter of the Jane in the story. "The new Africans would have to learn hard work by the whip for the rest of their lives. If a hoe rested too long, the whip popped. If cottonseeds didn't hit the dirt fast enough, the whip popped. Nobody could tell from what direction the sound of the whip would pop." Jude Daly's illustrations give us a bird's eye view of the events that take place in the story, and give it a sort of dreamlike feel. The muted browns of the earth the slaves cultivate are enhanced with splashes of color here and there--a red skirt, the yellow sun, a green tree. The back of the book includes a note from Alice McGill who gives some background information about slavery and the origin of Way Up and Over Everything. Carrying an important message, this book will be sure to spark many conversations and questions and would make an excellent addition to any classroom or home library. My recent reading of The Willoughbys (see my review here) inspired me to re-read one of my favorite books by Lois Lowry, The Giver. After reading the lighthearted and irreverant The Willoughbys, reading The Giver left me astounded at Lois Lowry's versatility and complete and utter brilliance as an author. Do I sound a little stalkerish here? The book begins when Jonas is about to turn 12. He's very nervous because this year at the Ceremony of Twelve, all of the "Twelves" will find out what career path has been chosen for him. You see, Jonas lives in a futuristic Utopian society where everything is carefully planned from the parents you receive to your spouse to the age when you receive a bike. There is no pain, no suffering, and those who do not fit in the community are "released" to "Elsewhere." At the Ceremony of Twelve, Jonas' friends receive careers that perfectly complement their personalities, but Jonas receives the most honorable position of The Receiver of Memories. This important person receives all of the memories of the world--good, bad, happy, sad--and an old man, the current Receiver of Memories, must pass them onto Jonas. Through "The Giver," Jonas learns what snow is, what sunshine feels like, and what the color red is. But along with these happy/comforting memories, he must experience pain as he sees the horrors of warfare, starvation, and more. Jonas soon realizes the unjustness of the perfect society in which he lives, and he and The Giver develop a plan to make things different. However, as with most "perfect plans," things don't go the way they're supposed to, and a perilous journey lies ahead for Jonas. Through this simplistic, yet gripping narrative, Lois Lowry brings us a thought-provoking book that stays with you for a while. What are the risks of living in a "perfect" society? What are the benefits of "sameness?" What sacrifices must be made to have a society free of pain and worries? Back in my days as an English teacher, I developed a unit of instruction based on this book for my 7th graders. The boys and girls alike really enjoyed the book, and it led to many in-depth discussions. One of their favorite activities was to write a final chapter to the book, detailing what happens to Jonas. I was always pleasantly surprised at their creativity, their different interpretations, and the care they took to write this final piece. Cross-posted at The Newbery Project. If you have a review of the The Giver, leave a comment with the link, and I'll post it here. Do you remember the poem, "Over in the Meadow?" And her little toadie one. In the sand in the sun. In her new book, Going Around The Sun: Some Planetary Fun, Marianne Berkes has adapted this poem to introduce children to our solar system. Old Mother Toadie becomes Old Mother Sun, and she's trying to get her planets in line. Each stanza of the poem is about one of the planets in the solar system, and underneath the stanza is a short fact about the featured planet. Venus shines a light so bright. Here is planet number two. In our sky of pink and blue. Venus 'sparkles' brilliantly, but it's not a star, it's a planet! " Pluto even gets a mention and a little chastising from Mother Sun for not staying in line, but it's made clear that Pluto is no longer considered a planet, but a "dwarf planet." This is nice because I haven't seen any up-to-date books for kids that reflect this change. This is a great page with lots of learning opportunities. You could have children name the planets in order and introduce cardinal and ordinal numbers. I can also see this page being used to introduce comparisons, such as "Jupiter is the biggest planet", and "Earth is bigger than Venus." You could even have kids identify colors. 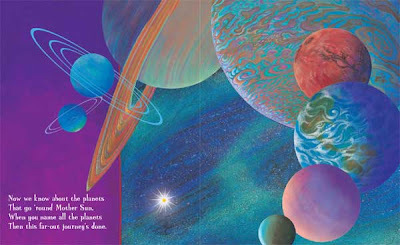 The end of the book gives more information about the solar system and the planet as well as additional ideas for supplemental activities and a list of resources from the author and illustrator. This book would make an excellent addition to any elementary classroom or home library and would also make a great read aloud. 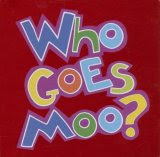 This cute little board book encourages children to match animal sounds to animals by asking questions, such as "Who Goes Moo?," "Who Goes Baaaaa?," and "Who Goes Cocka-Doodle-Doo?" The question is presented on the left page of a two-page spread, and a close-up, full-color photograph, along with the name of the corresponding animal is on the right side of the spread. The questions and photographs are on top of a colorful background that will attract young children. This is a good book to practice animal names and noises. It's also a fun way to spend some quality time with your young children. My one-year-old just giggles and giggles when my husband or I make the animal noises, and she tries to imitate them. Organized into different time periods, Pier 21: Stories from Near and Far tells the story of a shed-like building in Halifax Harbor that welcomed more than 1 million immigrants and refugees to Canada between 1928 and 1971. In addition to taking in newcomers, Pier 21 was the departure point of more than 500,000 service members on their way to fight in World War II. Rather than give straight, boring facts, Renaud details interesting information through compelling accounts of the people who arrived at Pier 21. Children will especially find the stories of "home children" and "guest children" interesting. "Home children" were British children who were orphaned or whose parents could not care for them. In the 1930's, these children were sent to Canada to work for families in hopes of a better life. While many of the families these children were sent to treated them well, some did not. "Guest children," were evacuee children from war-torn Europe who were sent to Canada as part of the Children's Overseas Reception Board (CORB). Children will be surprised to learn why this program ended. Other accounts in the book include those of war brides, European immigrants who came to Canada after WWII in hopes of a better life, and Hungarian "56ers", Hungarian refugees who arrived in Canada in 1956. In addition to the main narrative, each page contains more information about the stories including real photographs, stories, and quotes; a "History Note" sidebar that expands on the narrative; and illustrations reflecting the period. Like Island of Hope and Sorrow, Pier 21 puts a human face to immigration and war. The content and visuals make this book accessible to children of many ages, including "browsers" who may be reluctant to read books from cover to cover. It would also make a great supplement to any middle-grade history or social studies classroom. Visit the rest of the Nonfiction Monday roundup at Picture Book of the Day. This Thursday, April 17th, teen patients in pediatric hospitals across the country will receive 10,000 young adult novels, audiobooks, and graphic novels. Operation Teen Book Drop is organized by readergirlz and Young Adult Library Services Association (YALSA) in honor of the second annual Support Teen Lit Day. You can contribute to Support Teen Lit Day by donating your own YA book(s). Just download a bookplate (get them here), paste it in the book, and drop it off in a place that teens frequent on April 17th. When I was just three months pregnant with my daughter, I was browsing the children's section at a local bookstore already trying to find books for my new child's library. This book jumped out at me, and I simply had to buy it. There is a brief introduction at the beginning of each story that gives some background information about the featured goddess. For example, in the Nigerian-Yoruba story, we learn that Oshun has been worshiped for thousands of years, and one of her powers, among many, is to bring children to couples who don't have any. We then read the story of how Oshun "bargained with the gods as they prepared the Earth for the first humans and of how she gave birth to these first humans." Each story in the book is fairly short (5-8) pages, and through each one, children learn about the goddess and her culture. The illustrations also depict cultural symbols and clothing. This would be a great book for any child who likes mythology. It would also be a great way to introduce children to many different cultures around the world. I actually never read this book as a child, and I confess that the only reason I decided to read it now is to try to figure out clues on the TV show, Lost. As much as I like to read, I'm a big Lost fanatic, and this is one of the books that Sawyer reads on the island. This classic novel for middle graders begins on "a dark and stormy night." Meg Murry, her younger brother Charles Wallace, and her mother, a scientist, are in the kitchen having a midnight snack when a strange visitor shows up at their door. Soon after, this visitor, Mrs. Whatist, takes Meg, Charles Wallace, and their schoolmate, Calvin, on a dangerous journey to save Meg and Charles Wallace's father, a scientist who has been missing for over a year. A Wrinkle in Time has been a favorite of children for many years. Because I never read it as a child, I'm not sure if my opinion about it would be different. For example, I recently reread The Chronicles of Narnia, a series that I read multiple times when I was a child. While I observed some shortcomings in the books and was bothered by the religious undertones I never seemed to notice when I was a child, I thoroughly enjoyed rereading them as an adult and getting reacquainted with familiar characters and plots. Maybe I would have felt the same with A Wrinkle in Time. However, after reading it for the first time as an adult, it was just okay. I loved the characters…kind hearted Meg, the exceptionally bright Charles Wallace, down-to-earth Calvin, and the quirky Mrs. Whatist. The plot full of magic, space travel, suspense and mystery is good enough to get a child hooked on sci-fi/fantasy. The dark and frightening climax when Meg is fighting "It", the disembodied brain, will keep kids on the edge of their seats, and I think many will be eager to read the other four novels in the quintet. What bothered me though was the lack of detail I would have liked to have seen more of. I wanted to know more about Mrs. Whatist and company and more about Aunt Beast, the furry creature that saves Meg's life. I would have liked to have seen the aftermath of Meg's defeat of "It" on Camazotz. Were the people freed? Was "It" destroyed? Granted, this may be revealed in a later novel in the series, but I did wish that there was a little more background information. The other thing I had a hard time getting past was L'Engle's religious messaging. I admit that I'm uber-sensitive about having religious messaging in children's books that aren't advertised as religious-themed books. I feel that it alienates children of different faiths and is unnecessary in mainstream stories like this, especially when it adds nothing to the storyline. This has been a contentious issue since the book's publication, and L'Engle herself has always claimed that she talks about faith, not religion. I remain skeptical about that. But religion aside, I do think it's a book that many children will enjoy. Because there are some frightening situations, I do not recommend it as a read aloud to younger children. I think grades 5-7 would be the appropriate age range. I urge you to read Nymeth's review in its entirety because she had a completely different take on the book. If you have a review of A Wrinkle in Time, leave a comment with your link, and I'll post it here. Houghton Mifflin's spring catalog has some wonderful books for children of all ages, and I haven't been disappointed yet with the books I've seen from Girlwood and The Willoughbys to Sisters and Brothers. The Sea Serpent and Me is no exception. One evening, a little girl is having her bath when a tiny sea serpent slips into her bathtub from the faucet. After playing, the girl promises to take him back to the sea the next day. But the next day it's raining and the next day and the next day. As the sea serpent rapidly grows, the girl and the sea serpent become close friends as they play together, sing songs, and tell each other stories. But the day comes when the now giant sea serpent must go back to where he belongs. But is he ready to leave his new friend and return to the sea? Children will love the idea of a cute little sea serpent suddenly appearing in the bathtub one day, and they'll be entertained as they see the serpent grow and grow. Catia Chan's soft, yet vivid illustrations give the book a dreamlike and watery feel and create an enchanting atmosphere. This is a fantastic book that celebrates friendship, courage, imagination, and childhood. I highly recommend it for any child's library. Note: Why the official publication date is not until May 18, it's available on Amazon.com now.